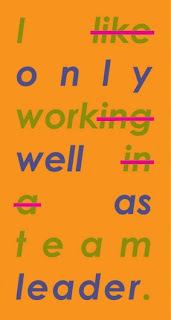 Performance, "Held der Arbeit", Relativity Group, Oddo/Convertito/Timlin. 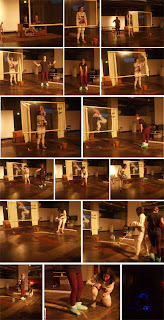 20:00 Performance, "Held der Arbeit", Relativity Group, Oddo/Convertito/Timlin. 20:30 Introduction: Suite Studio Group artists, Ima Picó, Sophia Crilly, Mark Kennard, and Namastic artists. Wendy gets her friends to form an air guitar band one evening before they go out for the night. Photo documentation with Janet Griffiths/Wendy. Salford, Manchester 2008. 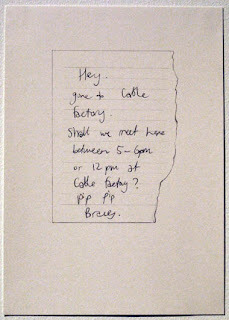 Frottage on paper, July 2008. 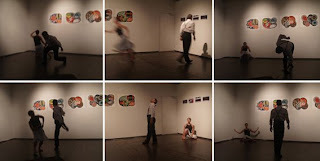 Jonathan Carson & Rosie Miller: ”A Game We Made Up” Installation. 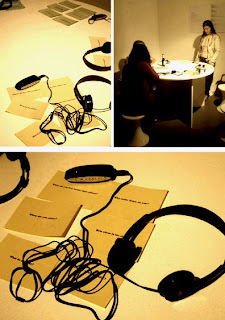 Sound recorded in Manchester, July 2008. 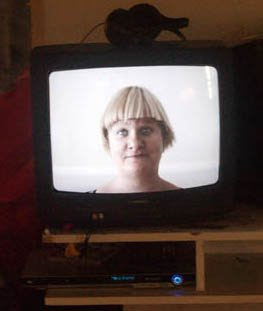 Video-installation, created in Helsinki, August 2008. 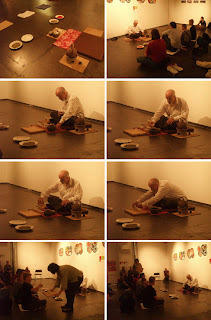 Audience can freely play and replace the objects, but don’t touch the TV. Have fun! 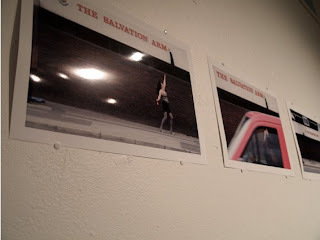 Photoshow of making the SWAP/VAIHTO in Helsinki. Jaana Kokko: ”In the forest there is a path of Martin Heidegger”. Video 12 min. Berlin 2008. 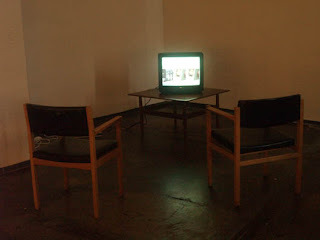 Video-installation, created at Islington Mill, Manchester, July 2008. Percy has no Mercy. + A wall by Vadelma ry. Free painting. DJ’s: Oravainen, Mise, Aleksi Perälä (aka Astrobotnia aka Ovuca, Rephlex Records), Physics, Tomplex, Senqi + guests. 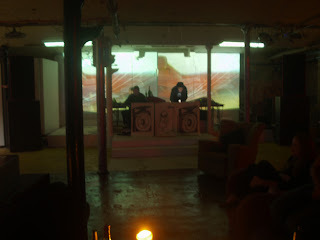 "solar panel sound machine" at the Islington Mill, Salford. The concert took place on Wednesday 16th of July. Here a short video clip of the performance. Thanks to Jonne for filming. OPEN CALL FOR ALL THE VJ´S TO PARTICIPATE! Born out of an intense two-week collaboration between 11 Manchester-based artists and the same number from Helsinki, Swap/Vaihto is an exhibition that aims to explore ideas of cultural identity and the collaborative process. All of the work on display was created in residence at Bureau gallery prior to the exhibition's opening and the wide variety of artistic practices present reflects the different artists taking part, with video and audio works, sculpture and drawing all included. Taking centre stage is Turbo Folk, a beautifully beguiling 3D installation by Jonne Pitkänen and Tom Watson. 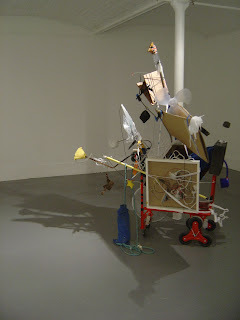 Made entirely from found objects, the sculpture adopts the form of an abstract recycled robot, brimming with personality and complete with antlers and a Dalek-like plunger. Reflecting his interest in drama, Juhana Moisander contributes a spooky hypnotic wall projection, which sees the artist wearing a face mask and slowly drawing a gun ad infinitum. Another standout exhibit is a series of exquisitely crafted small-scale card creatures from Samantha Donnelly. 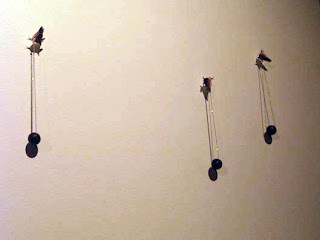 Surprisingly, all of the works fit together well, with the organic nature of the project apparent in every piece. Due to the collaborations that inform each work any comment on the issue of cultural identity is largely absent, but this is still a strong group exhibition that successfully explores migratory art practice. Barbro Björkfelt, Andrew Bracey, Jonathan Carson, Anne Charnock, Fiona Curran, Sophia Crilly, Samantha Donnelly, Janet Griffiths, Eeva-Mari Haikala, Hannu Häkkinen, Hannu Karjalainen, Mark Kennard, Jaana Kokko, Tim Machin, Rosie Miller, Juhana Moisander, Egle Oddo, Mikko Oravainen, Ima Picó, Jonne Pitkänen, Virva Sointu, Marko Timlin, Tom Watson. 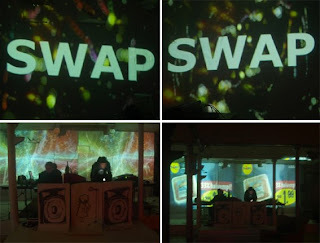 Namastic Art Collective is pleased to announce Swap/Vaihto, an international residency, exchange programme in collaboration with Ima Picó, Suite Studios, Salford/Manchester, UK, Bureau, UK, HIAP and The Cable Factory in Helsinki, Finland. Swap/Vaihto is an exchange programme between UK and Finland-based artists to explore ideas around collaboration and working methodologies, alongside current issues of cultural identity and migratory art practice. 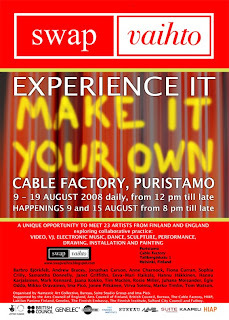 The project provides a unique opportunity for artists to spend time in residence in each country and engage in a period of research and production, culminating in exhibition at Bureau and event in The Cable Factory, Helsinki. 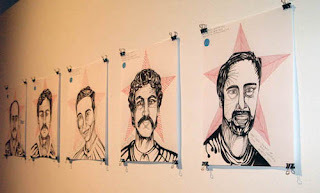 The project is based on the idea of Ima Picó, who is a Spanish artist living in Manchester. 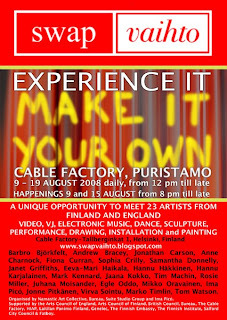 The UK and Finland-based artists were in residence at Bureau the 7th-19th of July, collaborating to develop new works and an exhibition, which took/takes place from 19th July to 9th August 2008. The residencies provide artists with an environment that encourages the exchange of ideas and instigates experimentation with new concepts and materials. The predominant focus of the Swap/Vaihto programme is as a means of establishing a mutual exchange of ideas. The artists will travel to Helsinki on 7th August for the second part of the project; to further develop their collaborative practice and explore the aspects of 'exchange' they have engaged with. This second part of the project will include a residency, open sessions and events at The Cable Factory, Helsinki. Doors of Puristamo space will be open to audience all the time artists are working, giving the Helsinki audience a unique possibility to observe the whole working process and meet artists at their work. A related publication will be launched in Autumn 2008. 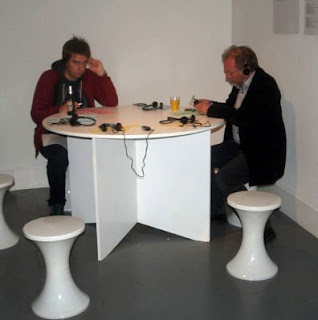 Suite is a long established artists' studio located in Salford. The studio comprises a broad range of practices and members meet on a regular basis. Many of the artists in Suite have emerged from the various MA courses in the region and the aim of the studio group is to create the conditions where artists can work in an atmosphere of critical debate around their practices. 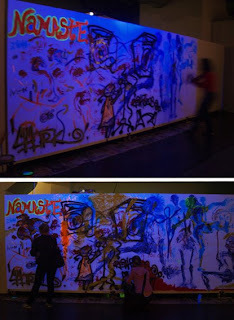 Namastic Art Collective is an artistic collective founded in Helsinki in 2006. The collective is based on a wide network of contacts and collaborations between artists and other professionals of art and related fields. 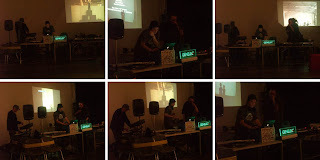 They are interested in the different approaches to the combination of electronic music and visual art in a live situation, in other words, the co-operation and interaction between visual arts and music. 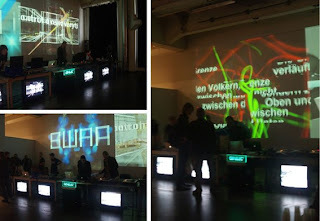 Swap/Vaihto is organised by Namastic Art Collective, Bureau, Suite Studio Group and Ima Picó. Supported by the Arts Council of England, Arts Council of Finland, British Council, Bureau, The Cable Factory, HIAP, Laitilan Panimo Finland, Genelec, The Finnish Embassy, The Finnish Institute, Salford City Council and Fatboy. For further information & images please contact Namastic Art Collective at the virva.sointu@gmail.com or at egodit@gmx.net. 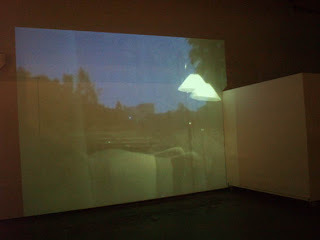 Above is an installation view of Carson & Miller's work A Game We Made Up (at Bureau). Jonathan Carson & Rosie Miller's collaborative practice investigates their shared interest in narrative. Their recent work has explored the principle of game-playing as a device to exchange stories and to generate new narratives. 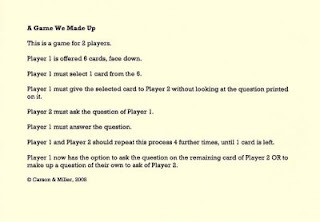 In A Game We Made Up (the new work they have completed during the first half of the Swap/Vaihto project) Carson & Miller have created a series of bespoke narrative games, designed to be played in specific locations matched to particular players (drawn from the people taking part in the exchange). 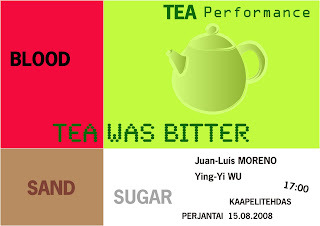 The resulting work - on show at Bureau until 9 August, 2008 - documents the playing of the games in audio and text format. 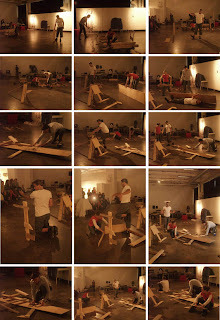 Carson & Miller are currently completing a new work, which draws on A Game We Made Up, for the second half of Swap/Vaihto. 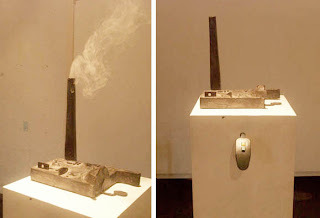 Both works will be shown at the Cable Factory. Carson & Miller thank all of their fellow players - they know who they are! 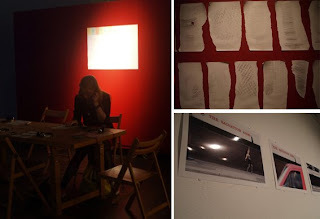 Title: "The Woman Steps Out"
Egle Oddo and Anne Charnock have collaborated to produce a piece of text that transplants a story from Berlin to Salford. Egle told the story from memory to Anne, who then re-wrote the tale with a local setting. 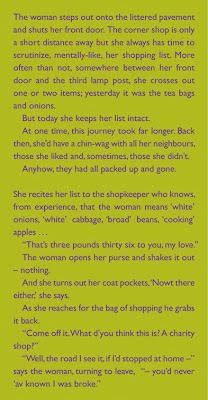 In fact, the true origin of the story is a poem by Bertolt Brecht and is set in Berlin during World War II (The Shopper, 1938). The new text is ‘misplaced’ in several ways. Not only is the setting different to the original, but the story changes in shape and emphasis because it is based on a telling of the story rather than the reading of the poem. When the new text was complete, Egle recited the Bertolt Brecht poem in English, reading from the Italian translation in her possession. 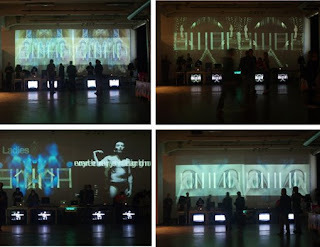 Loopvideo projection on darkned space. 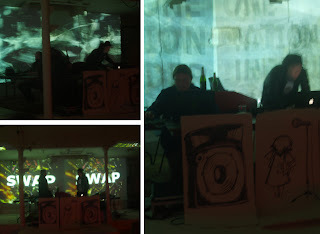 'Swap/Vaihto' Preview at Bureau, Salford/Manchester, UK. SWAP/VAIHTO is an exchange program between UK and Finland based artists to explore ideas around collaboration and working methodologies alongside current issues of cultural identity and migratory art practice. 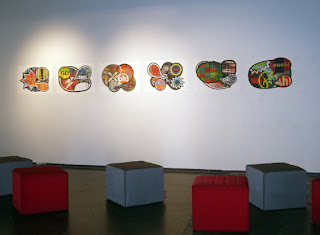 The project culminates in exhibitions at Bureau, Salford and the Cable Factory, Helsinki. Participating artists: Barbro Björkfelt, Andrew Bracey, Jonathan Carson, Anne Charnock, Fiona Curran, Sophia Crilly, Samantha Donnelly, Janet Griffiths, Eeva-Mari Haikala, Hannu Häkkinen, Hannu Karjalainen, Mark Kennard, Jaana Kokko, Tim Machin, Rosie Miller, Juhana Moisander, Egle Oddo, Mikko Oravainen, Ima Picó, Jonne Pitkänen, Virva Sointu, Marko Timlin and Tom Watson. SWAP/VAIHTO is supported by the Arts Council of England, Arts Council of Finland, British Council, Bureau, The Cable Factory, HIAP, Laitilan Panimo Finland, Genelec, The Finnish Embassy, The Finnish Institute, Salford City Council and Fatboy.